With his previous film, Blue Ruin, and now Green Room, Jeremy Saulnier has proven himself an emerging talent to watch. He’s also proven a tendency toward slow plodding suspense films with colors in the title and moments of truly gruesome violence. And rarely does he spare us the details. Few suspense films in recent memory show such mastery of tone. Saulnier approaches his films with a strong command of subtle visual storytelling and a strong sense of character as well. The world of Blue Ruin and Green Room feel lived in. We believe his characters have a history, if not with one another, with the things that compel them to do what they do. Pat (Anton Yelchin) is much like Malcolm Blair’s character in Blue Ruin. They’re both the least confident character in a film full of characters who are in over their heads. In Blue Ruin, Blair’s character was on a quest for vengeance. Here, Pat is in a fight for survival with his band mates after taking a desperation gig that ends with him walking in on a murder scene. 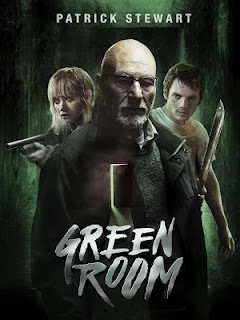 They end up locking themselves in a room when it’s obvious the owner, played by a very sinister Patrick Stewart, and his thugs have no intention of calling the police. They also discover the hard way that the goons are covering all the exits, and they’ll have to get creative in order to withstand repeated attacks. From early on it’s clear Saulnier isn’t going to over-explain the people and the situation they find themselves in, but that never proves to be a problem. Perhaps there could have been more personal investment had Saulnier given the band members more character development, but I assure you that’s a minor gripe in a film that works well enough as is. Rest assured there is information withheld until the right time, and the film has plenty of gruesome surprises in store. It also doesn’t force a romance on any of the leads simply because they’re attractive and find themselves depending on each other in relatively close quarters the way many other similar films have. To Saulnier’s credit, he also treats all the characters here as equals. All of the performances are solid and effective if not particularly standout. Anton Yelchin is the most likable one. He’s the one too good to be in this situation and very obviously in over his head. Imogen Poots is the tough as nails one with the most grit and the highest likelihood of survival in this bad situation. And the rest of the band are somewhere in-between. Patrick Stewart is the one who gives the most notable performance. He’s been a bad guy before, but rarely with such a disturbingly menacing performance. He’s a dark, evil version of Captain Picard. He’s stoic and knowledgeable in everything. He commands respect and loyalty from his crew, who are more than willing to give it to him. But instead of working for good, he applies it all toward nefarious deeds in order to save his own skin from possible legal trouble. About the only complaint to be leveled here is that it doesn't particularly push the genre in any way, nor does it take that next step for Saulnier. It feels fairly similar to Blue Ruin. And while that’s not a bad thing, it doesn’t apply Saulnier’s considerable talent toward something we haven’t seen before. Though if that’s the only complaint I can muster, than we really don’t have a problem. That’s more than I can say for anyone in one of Saulnier’s films. Though as a word of warning: considering recent events, this film likely carries a bit more weight now than it did when it came out back in April. A film about murder and hostages at a club may not be the right choice for some viewers.